Focusing on the Introduction section of a biomedical research paper, participants will learn the basics of scientific editing for formatting, content, grammar, and style. 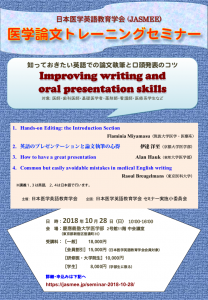 In this session we will look at real-life examples of common problems in medical English writing, focusing in particular on mistakes that are frequently made by Japanese authors. All of the examples that will be covered are based on actual samples collected either from manuscripts written by Japanese authors submitted for editing before submission to biomedical journals, or from oral presentations given by Japanese speakers.